Abort97 is a non-profit organisation trading under Acts of Grace 1 (Association Incorporated in terms of Section 21 of the Companies Act, reg. 2004/031572/08). Abort97 aims to change public opinion on abortion by proclaiming the full truth of abortion in a manner that persuades society to oppose abortion. The heart of Abort97 is to expose abortion for the human rights violation that it is so that people think, feel, and act differently towards it. In short, the goal of Abort97 is to expose abortion in order to bring about an end to abortion. One major project directed towards this end is Abort97.co.za. 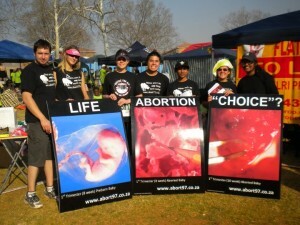 Abort97.co.za (now Abort97.org) was launched in April 2011, inspired by the work done at Abort73.com. We strategically take advantage of the technology of the internet to educate as many people as possible, using both secular and theological arguments to make a case against abortion. The motivation behind this endeavour is nothing less than our Christian calling to defend the defenseless, love the least among us, and expose injustices.